Social media and Mobile Money tax: Can Parliament undo damage already caused? 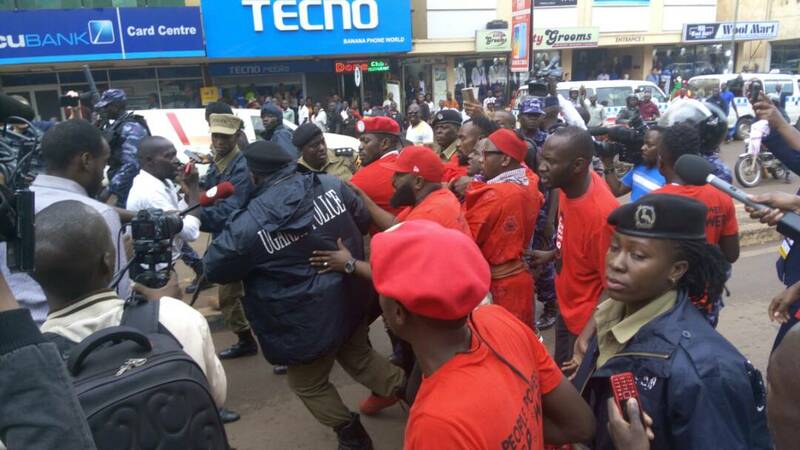 Police officers try to whisk MP Robert Kyagulanyi way from fellow protesters against the new taxes on Wednesday. KAMPALA – Speaker of Parliament Rebecca Kadaga will Thursday July 12, give her ruling on whether Parliament can, in an unprecedented move, suspend the Excise Duty (amendment) Act 2018, which saw government impose a Shs200 tax on users of Over the Top services such as Whatsapp and facebook among others, and also saw a 1% levy imposed on Mobile Money transactions. On Wednesday, the Prime Minister Dr Ruhakana Rugunda presented a statement on the OTT and Mobile money tax before the House, saying President Yoweri Museveni had considered the public outcry over the said tax and proposed that the Bill be re-introduced and discussed in Parliament next week on Thursday. “Government has noted public concerns regarding some of the elements in implementation of especially tax on mobile money transactions and OTT. The President has also provided guidance on the matter and encouraged further discussion with a view to reaching consensus on how we should raise the much needed revenue to finance our budget and undertake the development agenda we have set for ourselves without causing unbearable burden to the citizens,” Dr Rugunda said. He expressed government’s commitment to ensuring that the tax on mobile money and OTT are designed taking into account the public concerns and balancing the need to raise revenue to finance government’s development agenda. The Prime Minister, however informed the House that in the meantime Ugandans will have to continue paying the tax as the Bill is debated. He was reacting to the Speaker who tasked him to explain whether the tax still applies since Parliamentary rules of procedure dictate that an Act can only be ammended through the same process that a Bill is handled, which can only take a minimum of 45 days. MPs also noted that the premier’s statement indicated that goverment acknowedged errors in the Bill and therefore wondered whether government would refund money already collected from OTT and mobile money tax. The taxes came into effect on July 1, sparking public outrage which culminated in court petitions filed by a section of Ugandans, while others took to the streets in protest. Wednesday morning was dotted with scuffles involving police and members of the public in Kampala who marched to Parliament, led by Kyadondo East MP Robert Kyagulanyi, protesting the taxes. Donned in red T-shirts with the writings, “this tax must go”, the protesters were stopped by police at the Constitutional Square. Police were forced to fire live bullets and teargas carnisters when protesters ganged up to rescue MP Kyagulanyi from arrest. Similar scuffles were witnessed in Kamuli, Speaker Kadaga’s constituency. Mr Allan Sserulika, a lawyer told PML Daily that Parliament cannot recall the Act. “It can only make an ammendment through another Bill. When that passes it becomes Act amending the earlier Act. When the President assents to the ammendement it becomes law, Mr Sserulika says.